Now, this is going to be a bit of a longer review because there are so many fantastic tools to tell y’all about. I hope you bear with me, because these things are incredibly neat. The first products I want to tell you about (and the ones for which I have the most to say) are the Learning Palette kits. Learning Palettes are a neat learning system that uses a plastic tray, colored disks, and learning cards. There are 12 disks in all, and each card has 12 question on it. In the card shown here, Mr. Man needed to count the pictures, and match the colored dot in the corner of the picture (see how the cat has a green dot in his square? He would then put the green disk on the spot for “one”). 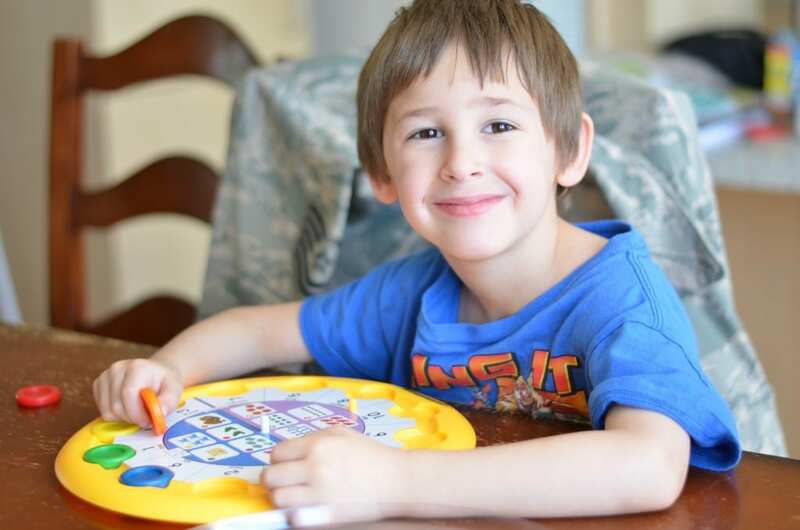 Mr. Man works systematically through the questions, placing the disks in their correct spot. 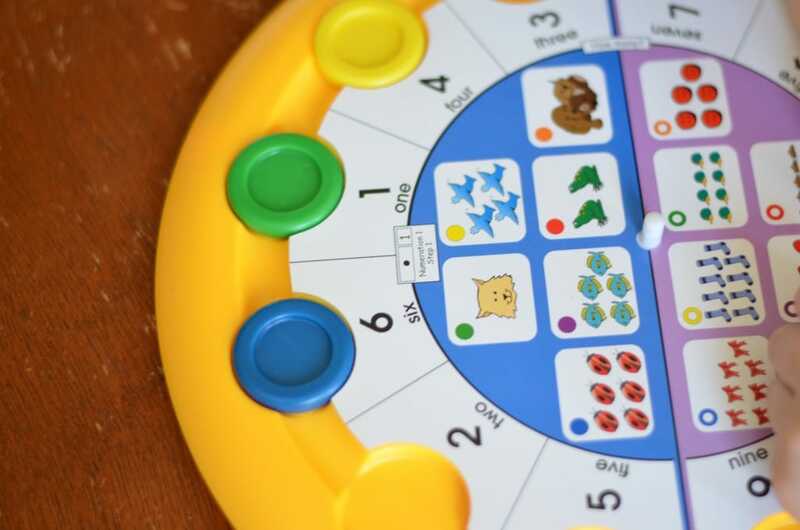 When he’s done, you flip the card over, and it shows you what colored disks went where, and matches the answers to the questions. The base center kits each come with one base, a set of the 12 colored disks, and 5-6 packs of cards with 12 cards each. Since we received the Math and the Reading Base Center Kit for the First Grade, I have Mr. Man do one card from each subject a day. He’s still on the young and squirrel-y side of 6, so while technically he’s a first grader, he doesn’t always act like it. 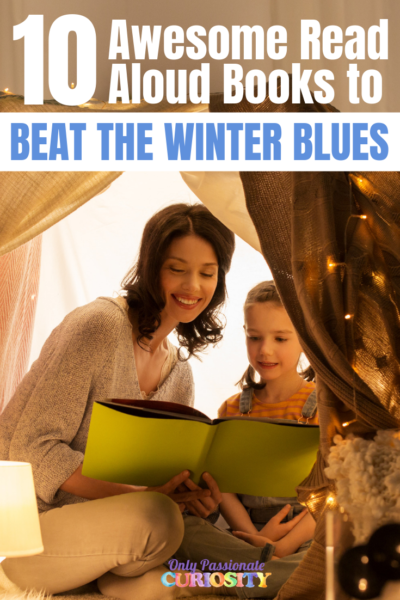 This product is one of those clever ones that leave room for real learning, while still feeling like a game, so it’s one of the few products I can use with him without soliciting groans from the peanut gallery. His one complaint about the Palettes is that sometimes, the pictures feel “too small” to him and are “hard to see.” Most of the time I get this complaint is when I put a new card in front of him, and it’s all undone, and therefor, overwhelming to his 6 year old brain. What works for me is sitting next to him, and reminding him of how to start, and how to proceed. I say something like, “let’s do the blue disk. What is the question for blue?” and before you know it, he’s got the card done. I love the self-checking aspect of this system, and being able to just flip the card over to check our answers. Learning Palettes are still new to us, and Mr. Man is still young, so for now, they still take coaching from me. However, I am optimistic that soon, I will be able to hand him the tray and the card, and he will be able to work independently. I really love this product, and am wishing I had the fourth grade cards to use with Bug too. I am considering adding them to our homeschool budget for the fall, since we’ve had such good luck using these with Mr. Man. The good news is the Palettes themselves are usable with all grade levels, so I would just need to purchase the cards to use them with the next child. 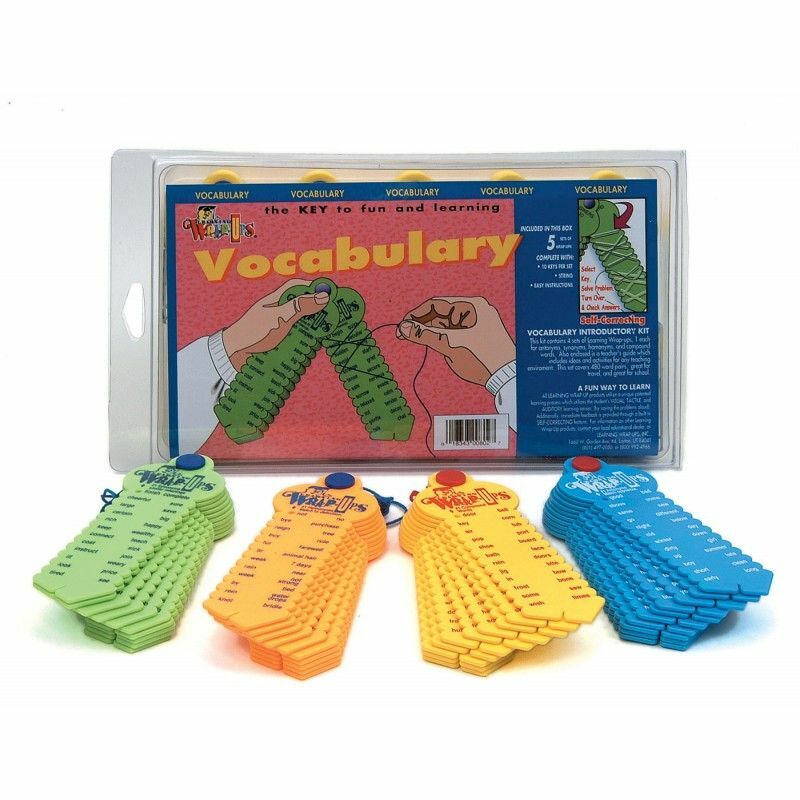 The next products to share with you are the Learning Wrap ups for Math and Vocabulary. Learning Wrap ups are neat little plastic “keys” with questions down one side, and answers down the other. You take the string, and wrap them around the keys from question to answer. 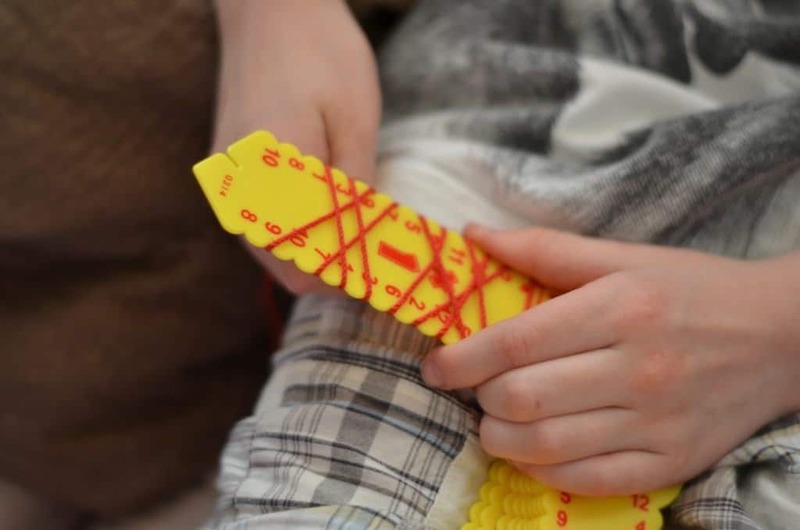 When you are finished, you look at the back of the key, where the plastic grooves indicate the correct string placement, so you can check your answers. 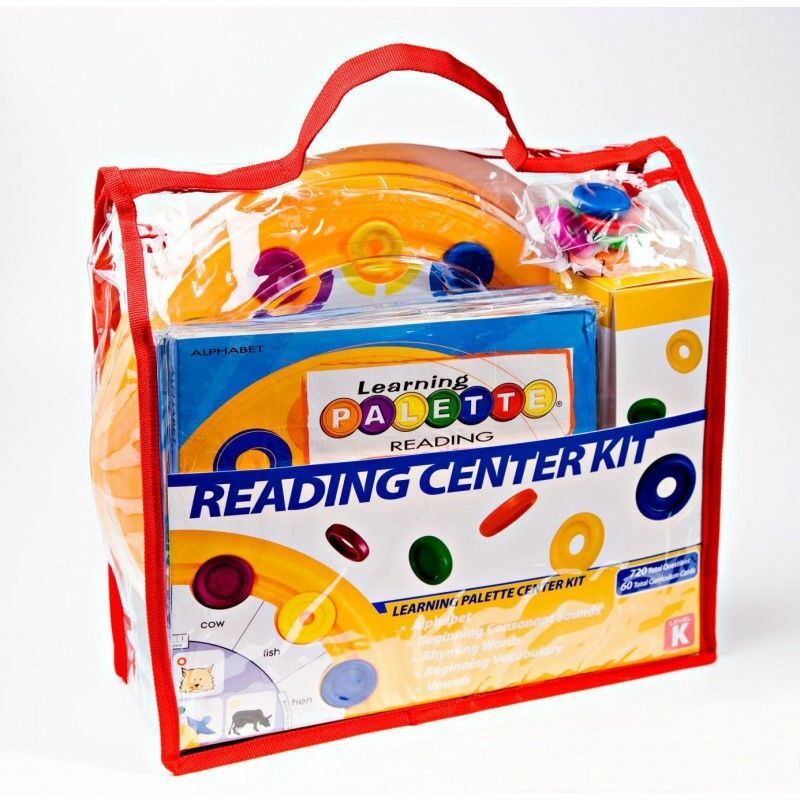 We received two sets of Learning Wrap Ups, the Basic Math kit and the Vocabulary kit. Both have received a huge amount of use in my house. 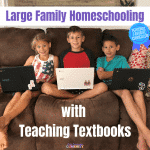 These products are actually ones I have heard of before- many homeschoolers have recommended them to me as a way to practice math facts, and I understand now why so many people sing their praises. These things are just awesome. 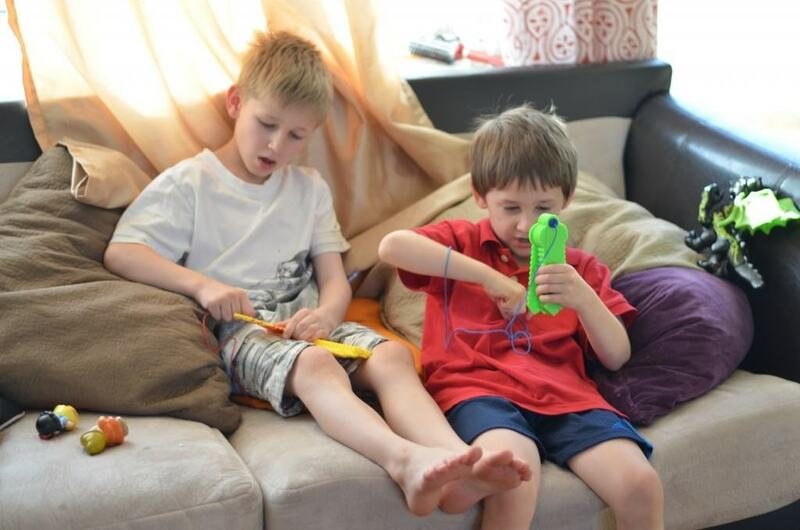 The boys really like using them, and have been known to “race” to see who can finish them correctly first. I love that so many different subjects and levels are included in each set, Mr. Man can work on addition, while Bug does the fraction set, and there is enough for everyone to use them and be happy. It’s also nice to note that they are sturdy too- Little Miss gets in on the fun and plays with the wraps along with the boys. So far, none are worse for the wear. 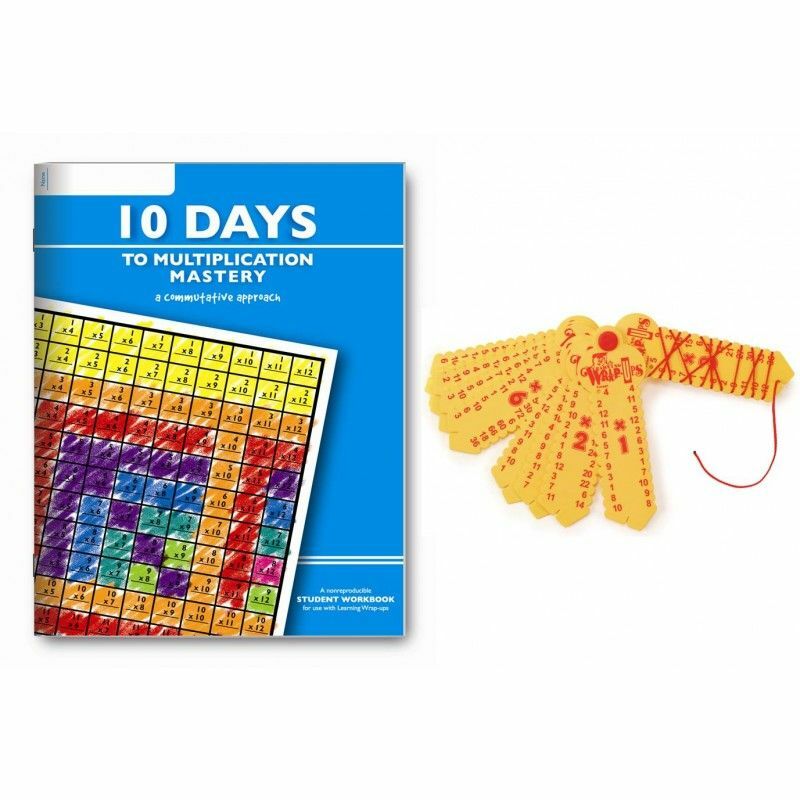 Finally, the last product we reviewed was the 10 Days to Addition Mastery, and the 10 Days to Multiplication Mastery books. 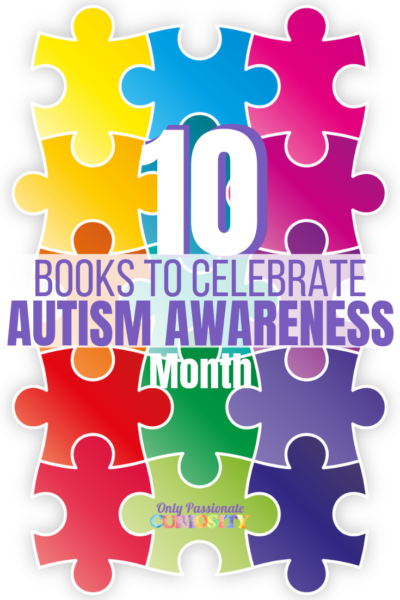 These are student workbooks that are intended to be used alongside the Learning Wrap ups and promise to help your child master their math facts in only 10 days. Basically, it works by having your child use the wrap repeatedly, working to complete it faster and faster, while they also use the workbook in conjunction. 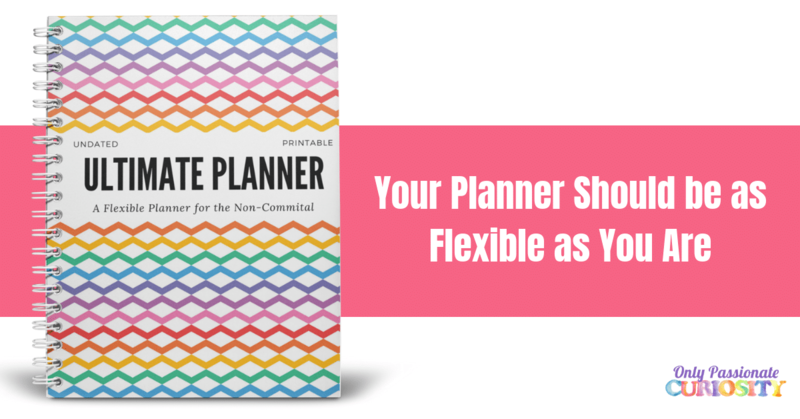 The workbook contains basic worksheets, table completion, and other exercises to get facts mastered in no time. My only small gripe with this product is that the pages of the workbook are thin (almost like newspaper) and don’t hold up well to children who press a little hard with their pencils. The content though is a wonderful quality. I like how the books use the commutative property to make it so your child only has to memorize half the amount of facts (because you know 3+7 is the same as 7+3) and only teaches a few facts a day so it doesn’t become overwhelming. These would be fantastic for summer review to help solidify math facts! If you are looking at purchasing these products, I hope you click on the banner below to read my crew-mate’s reviews. Everyone has tried products from all the age ranges, and some even tried the Learning Palette online subscription (not shown here). Check them out!